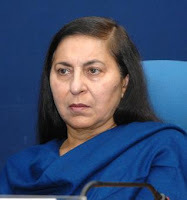 Deepak Sandhu, who has been an information commissioner for the last four years, on Thursday became the first woman Chief Information Commissioner of the country. A former Indian Information Service officer of 1971 batch, she was administered the oath of office by President Pranab Mukherjee at a function in Rashtrapati Bhavan, attended among others by Vice President Hamid Ansari. Ms. Sandhu had served in many key positions such as Principal Director General (Media and Communications) in the Press Information Bureau, Director General of DD (News), Director General (News) All India Radio before taking over as Information Commissioner in 2009. She had represented the country at international Film Festivals in Cannes, Berlin, Venice and Tokyo, International Conference on Terrorism and Electronic Mass Media at Glendzhik (Russia) and Cyprus besides Heads of News Meetings at Atlanta, USA and Beijing.